Even the most devoted exerciser can get tired of the same old, same old. Changing up your routine from time to time can keep you motivated. Remember to make it fun! Try a new activity. You don’t have to pound away on the treadmill to get a good workout. How about dancing? Do you like badminton or sand volleyball? Have you tried activity-based video games, with or without your kids? Or what about biking, gardening or horseback riding? Use exercise as an opportunity to have new experiences. Mix it up. You don’t have to do the same thing every day. Pick several activities you enjoy. Mix and match. The important thing is to move. Tap into your interests to keep things fresh and stay motivated. Exercise should be something you look forward to — not dread! Bump up your intensity. If you really don’t enjoy long exercise sessions, then high-intensity interval training might be for you. 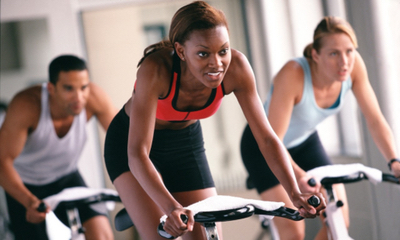 With high-intensity interval training, you alternate between intense activity and low-to-moderate activity. Getting your heart rate to climb and then return back down over and over again can be an incredibly effective workout, even if you have less than 10 minutes to exercise. In fact, studies have shown you can get some of the same benefits from short intervals at a vigorous pace as you can from spending a longer time at a moderate intensity. Here is an example of an interval workout: If you’re on a stationary bike, for instance, you’d warm up for a few minutes, and then cycle at a moderate pace and moderate tension for, say, 90 seconds. At that point, you’d either crank up the tension or speed or both for 30 seconds and follow it up by returning to your moderate pace and tension. You’d repeat the cycle a few times and end with a cool-down.